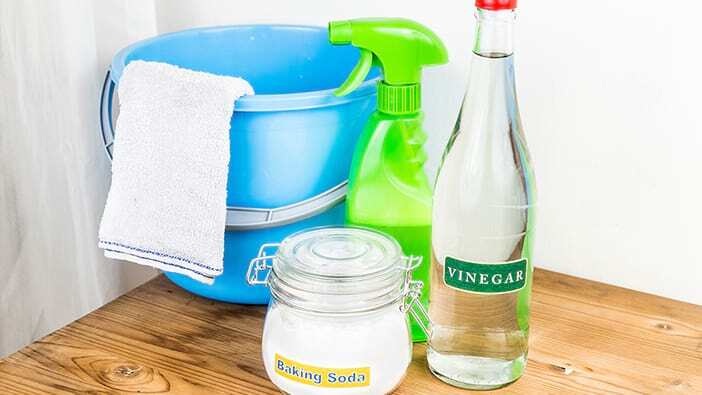 Most of those cleaning supplies you find in the cleaning aisle of the grocery store have toxic chemical agents that saturate your home’s environment. There's an alternative to using store bought cleaning products - make your own natural cleaning solutions. This article will show you how. Use a solution of 1/2 part white vinegar and 1/2 part water. Wipe clean with newspaper and lots of elbow grease. It may sound crazy, but it's better to use newspaper over paper towels, as newspaper prevents streaking. For this dusty window dressing, spray a microfiber cloth with a solution of salt water (one teaspoon salt to a standard spray bottle). Spray the cloth as needed to dust and remove gunk from your blinds. Add a big splash of white vinegar to a bucket of warm water. If you like, you can add a few drops of an essential oil with the scent of your choosing. Mop as usual. When the floor dries, the essential oil aroma will remain to cover up the sometimes not so pleasant smell of vinegar. Water and wood are not friends. Damp mopping is the key. You can damp mop with a solution of water and white vinegar. The only drawback is that over time, vinegar can reduce the gloss of your wood so use vinegar sparingly. For wood furniture polish, use a mixture of vegetable oil and vinegar or lemon juice. 2 parts vegetable oil to 1 part vinegar or lemon juice. For smells, you can make a powder from baking soda, tea tree oil, and another essential oil of your choice. Put all three in a jar with holes in the lid and shake it on the mattresses and furniture. Let it sit for about an hour, then vacuum. For stains, use 1/4 quart of water and 1/4 cup of baking soda. Blot stain and let it sit for a few minutes. Gently press to absorb excess moisture. Let dry and vacuum. Repeat as needed. Undiluted white vinegar is the key here. Place the vinegar in a spray bottle and spray under the rim. Scrub with a brush and flush. There may be a vinegar smell for a short while. If you want to avoid the smell of vinegar, use a few drops of essential oil. Place a plastic storage bag filled with white vinegar over the showerhead, secure the bag with a rubber band, and leave it overnight. One part hydrogen peroxide mixed with one part warm water is a great green mixture to remove mildew on shower walls and floors. Lastly, clear clogs by pouring baking soda down your drain, followed by one cup of vinegar. As you can see, you can maintain your home using environmentally safe products. Best of all, you can use the money you save on traditional toxic cleaning supplies to treat yourself to a nice, healthy meal. You deserve it! Don't forget to leave us a comment. We would to hear how you're using our natural cleaning tips or if you have any ideas for future 'Green Living' articles.